Judge and Mrs. Hanna were two of Mrs. Eddy’s strongest supporters when the Church in Boston was in its earliest stages. Judge and Mrs. Hanna and Ira Knapp shared the vision of Mrs. Eddy’s place in prophecy. The Judge served in the Union Army during the Civil War and in 1866 was admitted to the Bar in Illinois. He became a partner in a leading law firm in Council Bluffs, Iowa. He was appointed Judge of the County Court at age 23. When his wife was healed of an incurable disease in Christian Science, they both took up the study of Science and Health. In 1887, they both went into the public practice. In 1892, Mrs. Eddy called them to Boston to serve as editor and assistant editor of The Christian Science Journal. She gave them private lessons in class instruction. In 1898, she asked Judge Hanna to begin a weekly which became the Christian Science Sentinel. That year he was also serving as First Reader, a member of the Lesson-Sermon Committee, President of the Church. He was also made Vice-President of the Massachusetts Metaphysical College, and taught the Normal Class of 1907. In 1902, he felt he could no longer continue serving in these many capacities and left Boston to become a member of the Christian Science Board of Lectureship. 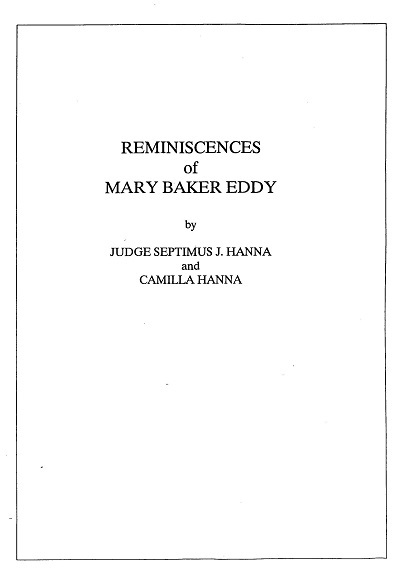 There were few Scientists as devoted to Mrs. Eddy as were the Hannas. In “Reminiscences,” Judge and Mrs. Hanna recount their many experiences with her. Included are her letters to them. Also in the transcript is Judge Hanna’s editorial, “Vision and Prophecy,” in which he compares Mrs. Eddy to the woman in Isaiah 54. Mrs. Eddy not only approved of the editorial, but asked that it be a lead article in the Journal, but it was never published, for the decision was made that it was too soon to speak of our Leader publicly as the woman in prophecy. However, Mrs. Eddy did not disagree with Judge Hanna’s recognition of her as one of the two witnesses.